Shopping for a new Toyota Mirai? Leasing a 2019 Toyota Mirai is a far better idea than buying one outright. 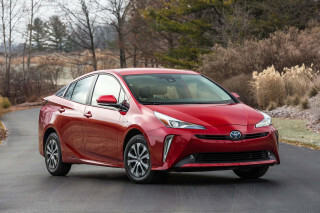 The 2019 Toyota Mirai hydrogen-powered sedan is the other, other option for green drivers—albeit a very small number of green drivers. The 2019 Toyota Mirai is a hydrogen-powered sedan sold in very small numbers in Northern and Southern California and Hawaii. It’s only available around refueling stations and does not run on any other type of fuel besides hydrogen. Good lease deals can be found in those areas, otherwise the 2019 Mirai is prohibitively expensive. Its lease price and included fuel costs are the best looking part of the car. If you haven’t picked up what we’re putting down, here’s what we mean: the Mirai isn’t fast, nor is it particularly attractive. Its 312-mile range is relatively good, and the only tailpipe emissions from the Mirai is water. 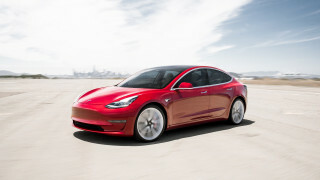 It’s powered by a 153-horsepower electric motor that’s supplied energy by compressed hydrogen. It drives only the front wheels, and its motor is tasked with moving two tons of people, gear, and clean energy. It’s comfortable for four adults—there are only four seats—and it has standard active safety features including automatic emergency braking. Every Mirai is equipped with 17-inch wheels, a 7.0-inch touchscreen for infotainment, two USB ports, and synthetic leather upholstery. Not many cars look like the 2019 Toyota Mirai and that’s OK. Efficiency will have to pick up where styling lets the 2019 Toyota Mirai down. We could pile on about the floating roof and recessed plastic, but you get the picture. The inside is a little better, even if it screams “This is from the future!” We hope it isn’t. Emissions-free driving is the first aim of the 2019 Toyota Mirai. How the 2019 Toyota Mirai makes power is probably more important to owners than any performance metric we can think of. The Mirai makes as much power as a compact car, but adds about 25 percent more weight for its fuel-cell powertrain. 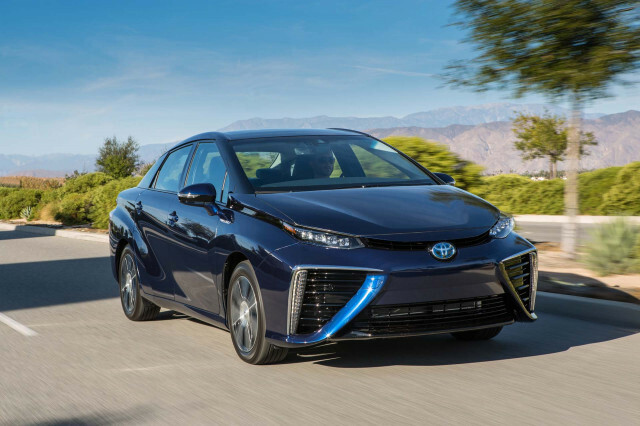 If we must: The Mirai is powered by a 153-hp fuel-cell stack that is powered by compressed hydrogen that, when combined with oxygen, creates electricity to power a motor that drives the front wheels. Water is the only tailpipe emission created by the fuel-cell system. The Mirai is best between 0 and 30 mph, where it feels a lot like a small car. At faster speeds, its weight is noticeable not only in acceleration but also in handling. Like most Toyota vehicles, the Mirai’s steering is very light, but also very vague. In our limited drives of the Mirai we noticed that it felt like an early Prius—a science experiment. 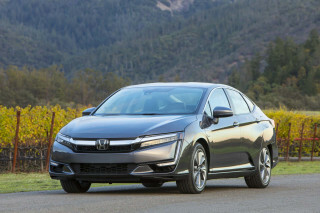 Among fuel-cell vehicles, the Mirai stops short of feeling complete like the Honda Clarity Fuel Cell. Bring friends to ride in your hydrogen-powered 2019 Toyota Mirai. Just not a crowd, please. The 2019 Toyota Mirai comfortably seats four adults—there are only four seating positions—in a pleasant and bright cabin. The seats are mostly comfortable, shod in standard synthetic leather, and spacious for four adults. The middle rear seat, which is common in most cars, is crowded out in the Mirai for hydrogen-related gubbins. The front seats are heated as standard equipment, and climate controls are operated via a touchpad that isn’t used on any other Toyota vehicle in the States. The Mirai doesn’t stop there. It uses a Prius-style drive shifter but an electronic parking brake that’s activated by a round button with “P” on it. The cargo area in back is smaller than an average sedan, due to the hydrogen tanks, so four passengers will have to travel lightly. We suppose that won’t be much of a problem considering the Mirai will only live within close proximity to hydrogen fueling stations, which are only located in California and Hawaii. The 2019 Mirai hasn’t been crashed by safety agencies. We don’t expect that to change much. The Mirai is a rounding error for Toyota’s overall sales numbers, it’s sold in very limited numbers and federal agencies typically ignore small-volume cars. Short of crash-test data, the Mirai is equipped with automatic emergency braking, blind-spot monitors, and active lane control. The hydrogen tanks are carbon fiber and, Toyota says, very safe in a crash. The 2019 Toyota Mirai is well-equipped—if you can find one. If you’re expecting holograms and virtual reality infotainment from a bleeding-edge 2019 Toyota Mirai fuel-cell sedan you may be disappointed. If you’re expecting a well-equipped car for a reasonable lease price, you’re in luck. Toyota sells the Mirai for nearly $60,000 but lease deals are far better than that. Hydrogen + 2019 Toyota Mirai = Up to 312 miles of range. There aren’t many cars like the 2019 Toyota Mirai so we’re going to bend our own rules on fuel efficiency. There are few direct competitors to the Mirai, and basically none of them live outside California or Hawaii where hydrogen fuel stations are available. Looking for a different year of the Toyota Mirai?